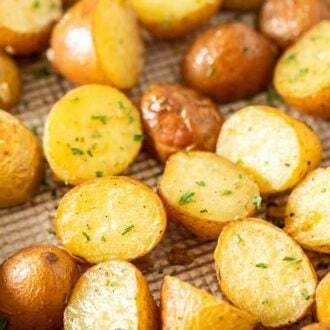 Simple Oven Roasted Potatoes made with Garlic and Parsley make an easy and delicious side dish that only requires a few minutes of prep and goes with so many meals! Whip up these crispy and golden roasted baby potatoes for a dinner that the whole family will love. Simple sheet pan recipes like these easy roasted potatoes, Baked Chicken Legs with Potatoes, or my favorite Brown Butter Maple Glazed Roasted Rainbow Carrots make great weeknight dinners that only need minimal prep and cook in the oven while you have time for other things. Easy Roasted Potatoes with a golden crisp crust and a soft fluffy center are my favorite way to eat potatoes besides Mashed Potatoes! Roasting the potatoes in the oven at high heat makes them so delicious and prep is really minimal especially if you are using small baby potatoes that don’t need to be peeled and can just be cut in half. These garlic roasted potatoes are always a hit in our house! I love to combine them with veggies and sausages to make an easy minimal-prep weeknight dinner. Cooking dinner on a sheet pan gives you more time to do other things while your meal is cooking in the oven and clean up is super quick. Give these crispy roasted potatoes a try and let me know what your favorite combination is! 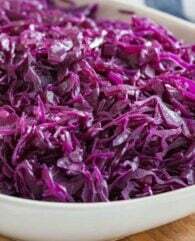 Don’t use Russet potatoes for this recipe, their thick skin needs to be peeled off, which makes them less crispy and you have a lot more work! Smaller potatoes equal less work because you only have to cut them in half. I recommend cutting the potatoes in half (or smaller) because having a straight edge on the pan makes them more crispy. If you’re not a garlic fan you can reduce the amount or leave it out and use your favorite seasoning on the potatoes. 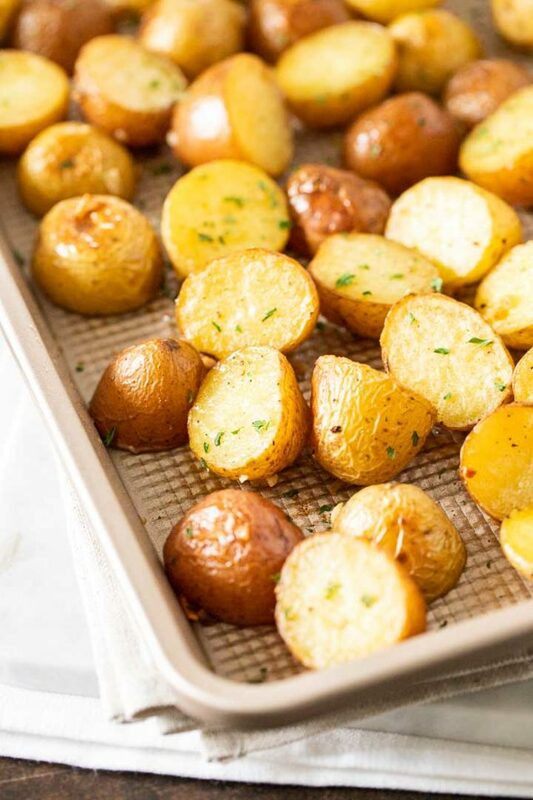 Place the potatoes cut side down on the baking sheet before putting them in the oven. This extra step is my secret for super crispy edges! I often roast carrots together with the potatoes! The carrots need about 30-35 minutes at the same temperature as the potatoes so they make a great addition. After prepping the potatoes and putting the sheet pan (with a bit of free space) in the oven I cut the carrots in half or quarters lengthwise depending on their size and put them in the same bowl where I mixed the potatoes and oil before. Add a little bit more oil if you want and season them with salt and pepper. Then I put them next to the potatoes on the sheet pan and roast them together until both are done. I love to add a tablespoon of butter and maple syrup to the carrots a few minutes before the time is up so they are nicely coated. You can also add your favorite smoked sausages to the pan to make a complete meal! 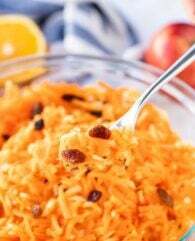 It’s one of my husband’s favorite meals and I love it too because it’s so easy. I pierce the sausages with a fork and then put them on the baking sheet with the potatoes for the last 15 minutes. Love this knife! It’s still super sharp and has the right size and weight to it. Perfect for all chopping jobs in the kitchen! These cutting boards are recommended by America’s Test Kitchen! They are super sturdy and easy to clean. 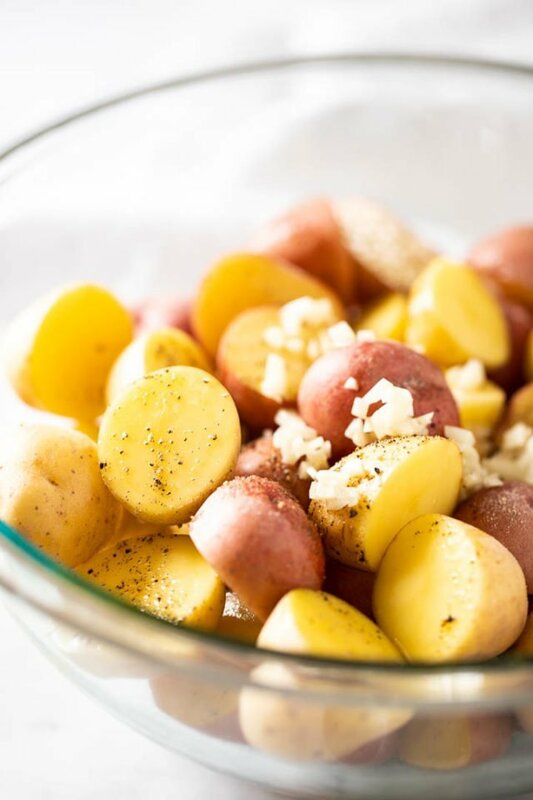 Want to try this Oven Roasted Red Potatoes Recipe? Preheat the oven to 400° F (200°C). 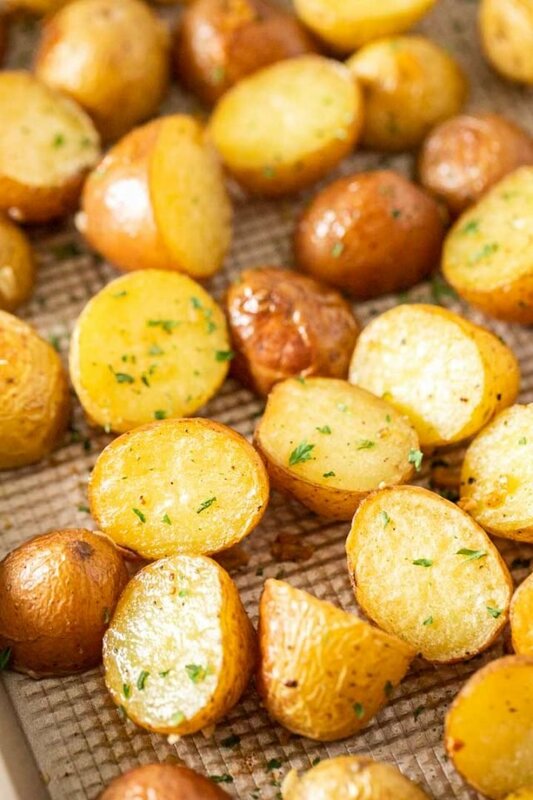 Cut the potatoes in half and put them in a bowl (if using normal sized potatoes cut them in small chunks). Toss with olive oil, garlic, salt, and pepper until evenly coated. 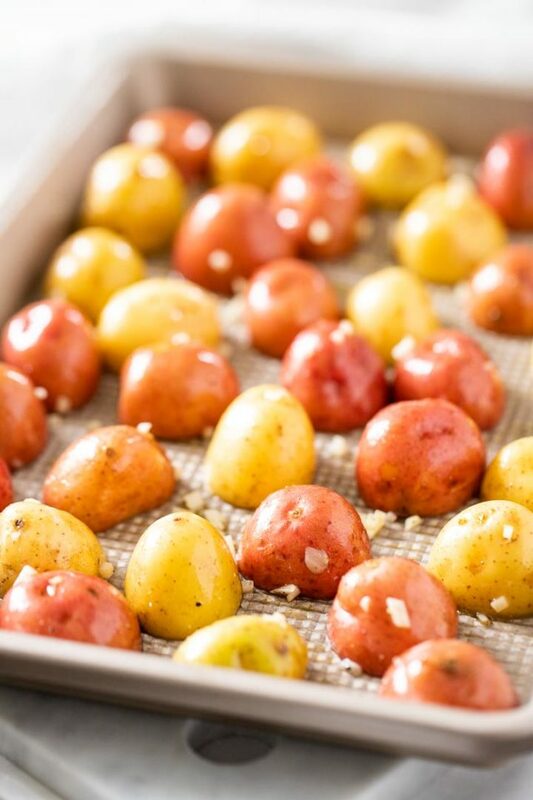 Transfer to a large enough sheet pan and spread out the potatoes in one layer, cut side down. Roast in the middle of the oven for 50-60 min flipping them twice during cooking until browned and cooked through. Take them out of the oven and toss with fresh or dried parsley before serving. Loved the recipe, the directions to make them and the ideas for other ways to make these. My family loved them! 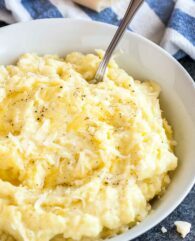 I added a little parmesan cheese at the last turn of the potatoes and it added a nice touch. Thanks so much!